We work hard don’t we? Juggling so many brightly coloured balls takes energy, commitment and caffeine. Sometimes they slip clumsily through my fingers and hit me in the face. I own being a busy working mummy. I may leave my son at home but he is NEVER not with me. We as a family make working work for us all. Thinking back to my pre-parent self I wonder what she did with so much time. If I could place a glass bottle in the sea of time I would send a glimpse of all I do to keep life going to my young self. Appreciate the quiet moments, the freedom, have more lie-ins and applaud what you will become. Earnestly if I knew how hard it would be I wonder if I would have been a mother…but then amongst the endless chaos, within the deep layers of exhaustion is a reassurance that I would want nothing less than my family. I think, in the mundane tasks of the everyday we may not recognise how much we do, how much we achieve. So here is a diary of my day. Its purpose? To provide a laugh, to remind myself to be fiercely proud, a little bit impressed and always glad. As should you my fellow remarkable lioness mummies who keep their worlds turning. Wake up at six and believe it gives me apt time to get everything ready and have a shower. Realise it’s raining and find coat and wellies for little boy. Wellies are in car. Run to car in see through pyjamas. Scare elderly neighbour. Make lunch ready for childminder to feed Leo. Briefly wonder why I am paying her so much. Blow up plastic plate in the microwave whilst part cooking baked potato. Mix tuna mayo, grate cheese and put in cute mixture bowls that I have never used before. Eat half the cheese for breakfast. Panic make packed lunch for in case they go out for the day and can’t carry backed potato and cute impractical bowls. Put all breakable things in cupboard in case superhero play gets out of hand. Make packed lunch for childminder. She really should pay me. Try and pay bills and be put on hold to music that makes me angry. Write shopping list. Put laundry on. Realise it is suddenly 7 am and grab the dry shampoo. Put mascara on in hope of looking attractive. Spill tea down freshly ironed clothes. Spend 10 minutes quietly opening the boys curtains, gently wishing him good morning, stroking his back…then start singing The Who loudly and pull him out of bed by his feet. Try to post floppy limbed offspring into clothes chosen the night before. Lure child into bathroom to wash face, brush teeth (be forced to wobble all one by one to check if a tooth fairy visit is imminent). Then observe as he wees all over the toilet you cleaned the day before. Play cars for 7 minutes. Put Scooby Doo on and hold toast to child’s mouth and bribe him to eat after 15 minutes of him ignoring it. Pack work bag and find a batman in purse. Flee when childminder arrives. Count to 10 and dragon breathe in the car. Chuckle at Tribal mums chatter then zoom to work listening to sad 80’s pop music. Go to serious adult job. Eat lunch at desk (not allowed) because so busy, franticly text childminder every hour to check for signs of life. Zoom back to relieved childminder. Hug the child and realise how much you missed him. Take piles of crap to tip and charity shop whilst the boy hunts for Pokemon and tells me about his day. Get a McFlurry on the way to gymnastics class. Get annoyed at City traffic. Sing old MacDonald. Get to gym, change boy then use the 40 mins to jog to the bank pay in cheque. Start sweating. Collect equally sweaty hyperactive boy from gym. Piggyback 10 mins to the carpark. Get home to find neighbours child on doorstep. Entertain both boys with riveting personality, UNO and Mario Cart Wii. Stick them both on the trampoline to prepare boys dinner. Have a 12 minute discussion about a dead beetle. Chat with exhausted mum of neighbouring child whilst kids shriek. Coax Leo into eating broccoli and eat half a tin of rice pudding left over from his afters. Put it on Instagram. Run bath, get prodded by boy with lightsaber, role play whilst putting mine and OH tea on to cook for later. Run up and down the stairs at least 47 times. Overcook dinner. Say things like, ‘You put that Picachu down now..do not throw Picachu at Mummy. Picachu does not go down the toilet!’ Sign again. Pile washing in sink, run water. Forget about it. The little lion kicks his football in house. I use the SHOUTY voice. Then feel bad at using SHOUTY voice. Put boy in bath and watch him from the hall whilst folding laundry. Be called every 2 minutes every time a star ships falls out of the bath. Drag reluctant child out of bath, hunt for pyjamas and read story with dubious character voices. Wash dishes in cold water whilst Tweeting with wet hands. Start to write blog post but get interrupted by child getting out of bed every ten minutes. Lie by little boy till you dose off and dribble up arm. OH comes home to half asleep dribbly woman with hair stuck up. I am full from leftovers. Feel to tired to shower. Smelly. Attempt grown up conversation. Fall asleep. This is a holiday day. A school day is much more manic and requires clean uniform and hairstyling. If you enjoyed this post check out our new YouTube channel here. The Parenting Jungle pack has got its Vlog on! LOVE this. 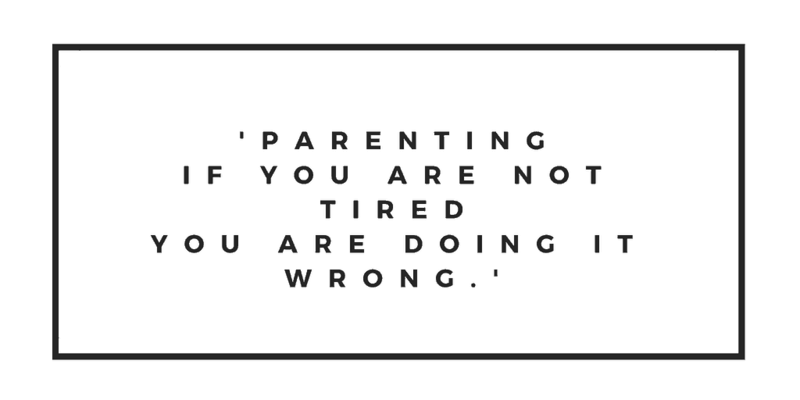 You’ve captured the mania of a working mama so perfectly – though I suspect your day is a bit more manic given that you have a child who is capable of expressing their opinions in ways other than just vigorous head-shaking. I’m falling asleep in my child’s room a lot these days too. Glamorous this job ain’t.